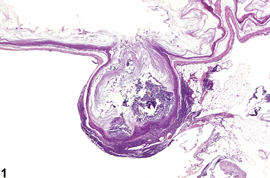 Stomach, Forestomach - Diverticulum in a female B6C3F1 mouse from a chronic study. An out-pouching of the wall of the forestomach filled with keratin, inflammatory cells, and ingesta is present. Stomach, Forestomach - Diverticulum in a male B6C3F1 mouse from a chronic study. An out-pouching of the wall of the forestomach is present. Diverticula are more common in the forestomach than in the glandular stomach but can occur from the esophagus to the colon. Diverticula are congenital defects characterized by out-pouchings of a portion of the wall in which the normal cell types are present. The wall and lumen of a diverticulum are continuous with the wall and lumen of the forestomach ( Figure 1 and Figure 2 ), although the communication between them is not always visible ( Figure 2 ). 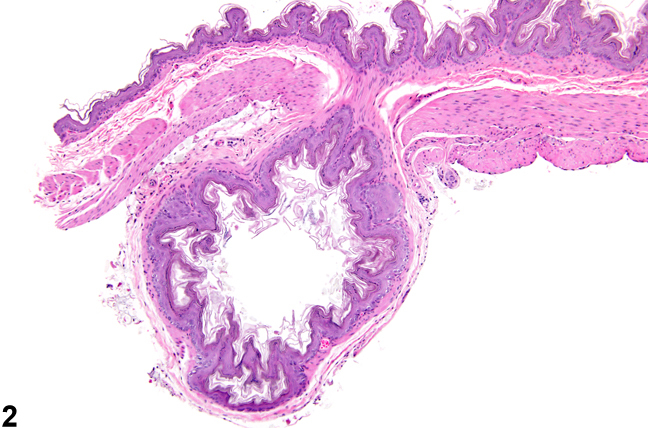 Diverticula are occasionally misdiagnosed as a adenomas, but diverticula lack many of the features of neoplasms, such as a mass-like proliferation of cells, cellular atypia, and loss of normal architecture. 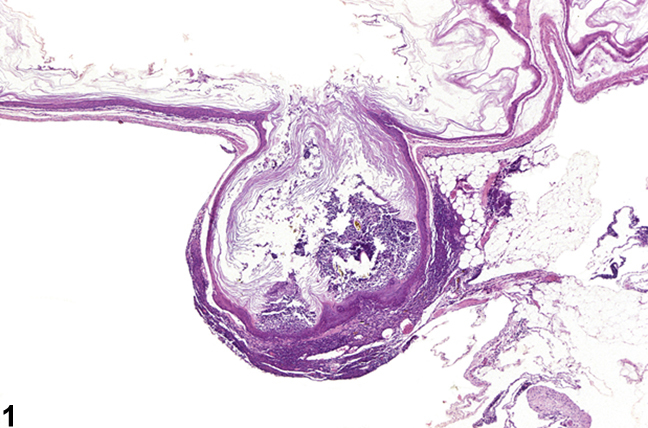 Diverticula may become impacted with food, ulcerate, become locally inflamed, and eventually perforate, leading to abscess formation. Diverticula are considered incidental lesions. Diverticulum should be diagnosed but not graded. Associated lesions, such as inflammation or ulcer, may be diagnosed separately if warranted by severity, but the pathologist should make the association with the diverticulum clear in the pathology narrative.